The blurred vision and clouded heads of the world's investment advisors are beginning to clear from the crushing one-two punch delivered by the mortgage and credit behemoth. The question now is: will we be able to focus on a good counter and stay on our toes after the standing eight count? Before we, as advisors, come out of our corner swinging, we need to have a plan of attack. We need to go back to the basics of what works and look for ways to incorporate new tactics to take full advantage of the coming rounds. What we cannot do is panic or huddle in the corner with our hands over our face and wait for our opponent to deliver the final knock out punch. This is the time for advisors to take action and consider alternatives-alternative investments. Alternative investments have come to the forefront during this recessionary period. Rarely does a day go by that my email isn't filled with offers about programs or wholesalers suggesting one of several "recession-resistant" investments. Alternatives are important assets that include not only the public-traded options available through the various exchanges, but also their non-traded counterparts offered as direct participation programs (DPPs) or private Reg. D offerings for accredited investors. For the purposes of this article, we are going to confine our discussion to REITs, more specifically REITs that are public traded and public non-traded. The question of which type of REIT is best for the client has become a hotly debated issue. The proponents for both types of REITs feel strongly about their position, and can produce data to support their loyalty. The issue for me isn't that one is better than another but how to best take advantage of both for the benefit of my clientele. Though these issues are important to understand and may have an impact on an advisor's decision to pursue one or the other type of REIT offering, there are more fundamentally important issues to consider before picking a side in the debate. My chosen path is to ignore the debate altogether and focus on doing the right thing for my clients. Several academic studies show that adding REITs to a client's portfolio increases the success rate for income withdrawals by 1%-2% over a 30-year time frame. An example of the Monte Carlo simulation follows (see above Asset Allocation chart). We will use a portfolio with an 80/20 equity/bond ratio. The simulation revealed that this portfolio had an 84% probability of success in meeting the client's five percent income withdrawal goal over 30 years. The study continued by showing that by adding REITs to the portfolio and re-allocating equities and bonds depending on risk tolerances the client's chances for success improved as follows. The Monte Carlo probability percentages are depicted under the success rate column. As you can see, with each subsequent drop in the equity and bond allocation and respective increase in REIT allocation, the probabilities of the portfolio meeting with success increase. This allocation only takes into account the public traded REITs based on market returns from 1972-2005. The factor that is not included is the impact of public non-traded REITs. How would non-traded REITs affect the performance of the portfolios listed above? Let's explore REITs a little deeper and find out. During the initial research phase we discovered a tremendous amount of information that showed the correlation of public traded REITs to market indices like the S&P 500, but no substantial correlation information existed to show the correlation of public non-traded REITs to the stock market. To effectively incorporate the non-traded REIT into a client's portfolio, advisors need to be able to ascertain how the non-traded REIT will act in certain market conditions. Correlation data can provide a template of historical information to aid the advisor in building better portfolios that can stand up to difficult market conditions. By understanding the underlying real estate asset of a REIT you can begin to construct a more efficient portfolio. Though correlation data is not clear on non-traded REITs, it is very clear on the public traded side. By extrapolating the public traded REIT correlation data over to a non-traded REIT with similar underlying real estate assets, an advisor can gain a sense of how the non-traded REIT may act in relation to, not only the market indices, but to other real estate asset classes within the REIT sector. For example, if the total REIT market is represented by a correlation coefficient of 1.0 and an industrial REIT can be represented as 0.75, the industrial REIT is 75% correlated to the total REIT market. We can apply this to a specialty REIT like Timberland, which for the purpose of this discussion we will give a correlation of 0.40 or 40% correlated to the total REIT market. The bottom line is, the more closely correlated to the total market an investment is, the more likely it will act in a similar manner based on conditions affecting the market. If the total REIT market goes in decline, all closely correlated REITs will also show some decline. The less correlated a specific REIT is to the total REIT sector the less it is affected by adverse conditions or declines within the entire asset class. On the upside in growth markets the same low correlated REIT will likely not perform as well as the total REIT sector. Another important factor to consider with non-traded REITs is the impact of being non-traded. 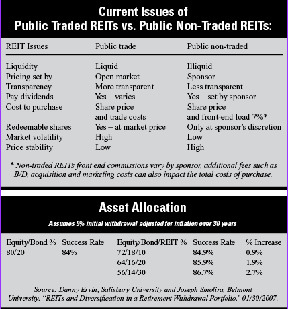 As shown previously in the current issues chart, factors that public traded REIT proponents consider a negative-like illiquidity, set share price, and set dividends-can be a positive, especially in downward trending markets. You need not look any further than this past year's public traded REIT performance in relation to the overall market. The traded REIT sector had a first class seat to the impact of correlation asymmetry (the undesirable situation where correlations increase during down markets). As the market fell, it dragged lower correlated assets like traded REITs with it, like debris being sucked down in the draft of a sinking ship. The impact of correlation asymmetry is most often felt by investors in public traded assets like stocks, bonds and mutual funds. The fact that non-traded REIT share price and dividends are established by the sponsor creates a more reliable income to the investor. As both traded and non-traded REITs base dividends on underlying asset value, lease performance and management expectations, the set dividend of the non-traded REIT makes a strong case for being utilized by advisors, especially to prepare for the possibility of downward trending markets. The stability in price and dividend causes a non-traded REIT to act more like a fixed asset akin to a bond or preferred stock. This non-traded aspect would lower the correlation coefficient in relation to the traded REIT. This lowered correlation increases the benefit of non-traded REITs to an investment portfolio. The overall effect of lowered correlation also can increase the probability of investor success discussed in the previous Monte Carlo analysis. Used in conjunction with traded REITs, you can provide a client with the best of both worlds-liquidity and stability. Craig Porter-Rollins, RFC, is a member of the Real Estate Investment Securities Association, Indianapolis, Ind.